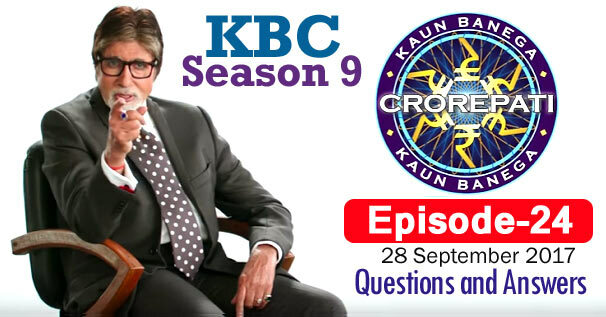 KBC Season 9 Episode 24 Questions and Answers: The twenty-four episode of Season 9 of Kaun Banega Crorepati (KBC) was telecast on 28th September 2017. In which Amitabh Bachchan had asked contestants 17 questions of General Knowledge. The correct answer to all the questions is given below each question. By reading these questions, you can prepare yourself for the next KBC Season 10 of Kaun Banega Crorepati. Because by reading these questions, you will understand what kind of questions asks Amitabh Bachchan in KBC. These all general knowledge questions will be helpful to for you various Competitive Examinations and Interviews besides KBC. Remember, the answer to some question may be in accordance with that time, while the answer to those question may differ according to the present time. 1. Which of these Hindi phrases is used to denote high inflation? 3. Which one of these four birds has the longest beak and feet? 5. Which of these formulae is used to calculate the area of a rectangular agriculture field? 6. Which one of these festivals are celebrated during winter in India? 7. Which cricketer holds the Indian record for the highest score in a match in the ICC Women's World Cup? 8. Which of these chief ministers of Delhi once served as the youngest minister of the Haryana government? 9. According to belief, at which place near Kurukshetra did Lord Krishna deliver the message of the Bhagavat Gita to Arjuna? 10. Of these 29 states in India, how many have the names of its two separate regions in the name of the state? 11. Who headed the nine-judge supreme court bench which declared the right to Privacy to be a fundamental right under the Indian Constitution? 12. Arrange these political parties in increasing order of the number of MPs they have in the current Lok Sabha? 13. Which of these expressions means 'superb' in colloquial Mumbai Language? 14. Which animal lends its name to a stock market in which share prices are rising, encouraging buying? 15. Which of these modes present in a smartphone disables phone calls and Bluetooth? 16. Shorts are not normally part of the uniform of which of these sports? 17. Which character is being described in this song?